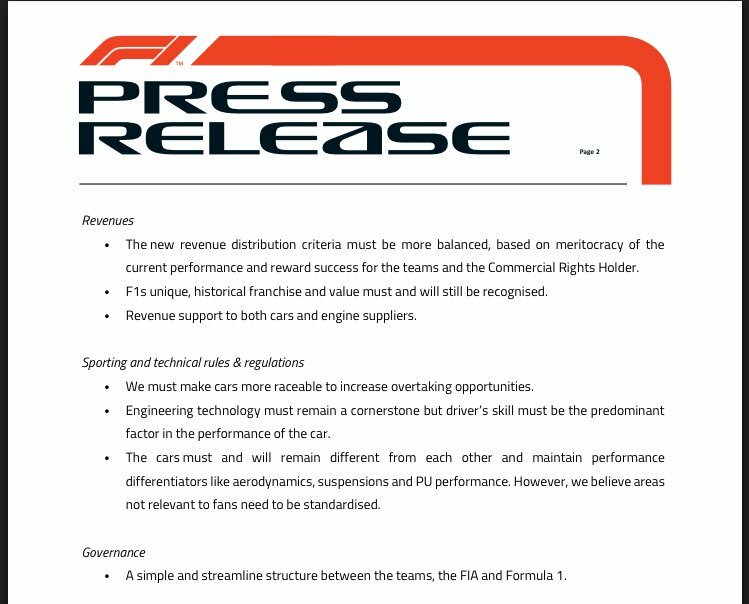 - More balance revenue structure "based on meritocracy"
- Make cars more raceable to increase overtaking opportunities. I’m sensing some reaction coming from Ferrari president soon....!! Brundle says that Ferrari might get a 40 million bonus and the engine suppliers (Mercedes Ferrari Renault and Honda) will get an extra 10 million. Ferrari will get $60 million, 50 as historical and 10 as PU provider, so probably we will separate PU development department and have 150 million to develop the car. (As everyone else) PU development have no cost cap. Ferrari and Mercedes remain the two teams that need the most convincing. Immediately after the meeting, Toto Wolff and Niki Lauda met with Maurizio Arrivabene at the Mercedes hospitality building to discuss what they'd heard. Doubt most of that will happen. 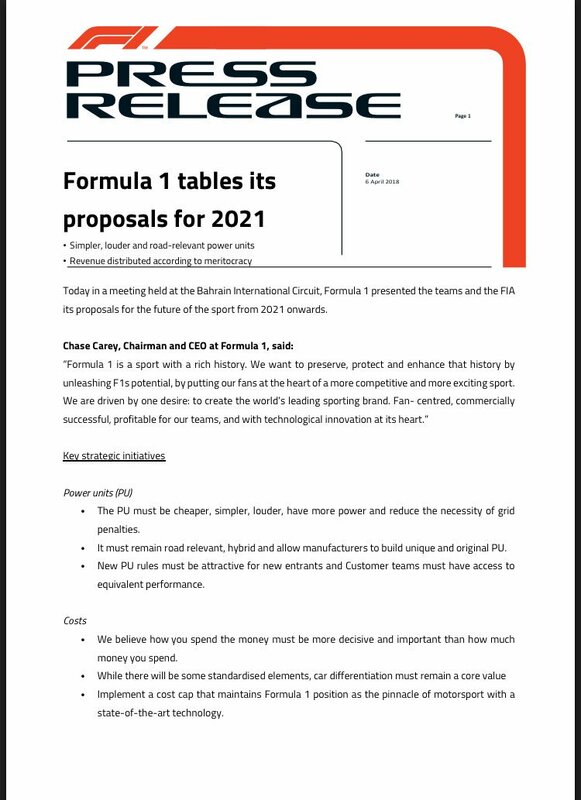 Budget cap mainly, sure we tried that before when FOTA was around and Red Bull were suspected of cheating it and most teams left. Too hard to police. Thanks for quick answering, don’t you think expert external reviewers can make it work ? A budget cap that works could do wonders for the midfield. External reviewers / auditors can't. Impossible to implement, especially in case of teams like Mercs who have their own road car and non F1 engineering departments. F1 departments will simply offload some of their work / purchasing to those departments which won't be possible to track unless someone questions the source of every little component, every little resource. Then there's the question of transfer pricing. Ferrari owns it's wind tunnel. It may 'charge' it's F1 department for usage at a lower cost than it might cost other teams to go out and get wind tunnel time. Very difficult to determine the 'fair' price in such instances since Ferrari can simply argue it's wind tunnel cost structure is more efficient.